With week two we step away from the kid stuff and delve into a more adult palate. And by that I mean we’re adding alcohol. Liquor and beer have already played a key role in past flavors like Baileys, chocolate Kahlúa, and chocolate Guinness, but this will be the first foray into using a wine. A brunch favorite, and one of the few ways I actually enjoy orange juice (outside of creamsicle ice cream, of course), the mimosa is a go-to beverage for both classy and casual affairs, and somehow avoids the morning drinking taboo. As someone who doesn’t do much drinking, it’s pretty unlikely I’d have one to start the day, but I think it’s a fabulous addition to brinner (that’s breakfast for dinner, if you’re among the uninitiated), especially for ladies nights. 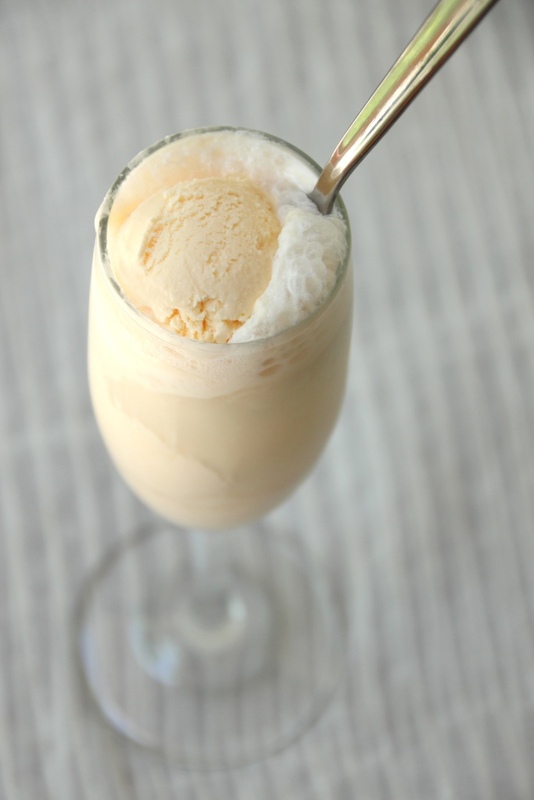 Today we take the orange juice and champagne combo into dessert territory: mimosa ice cream. A fairly complex flavor for ice cream, it starts out solely orange on the tongue but you’ll quickly notice there’s something else there. It’s not fizzy, obviously, but the champagne lightens the flavor and plays perfectly with the bright citrus of the orange juice. I used one part orange juice to two parts champagne, but you can easily adjust the ratios to suit your preferences, just make sure you have 1.5 cups of liquid total. This is one of the few flavors that I felt was perfect on the first try, but I do tend to prefer a somewhat subtle alcohol flavor in my desserts. The liquid is reduced to a half cup (or slightly less) to maintain the wonderful flavor but remove most of the excess water, resulting in a much creamier texture. 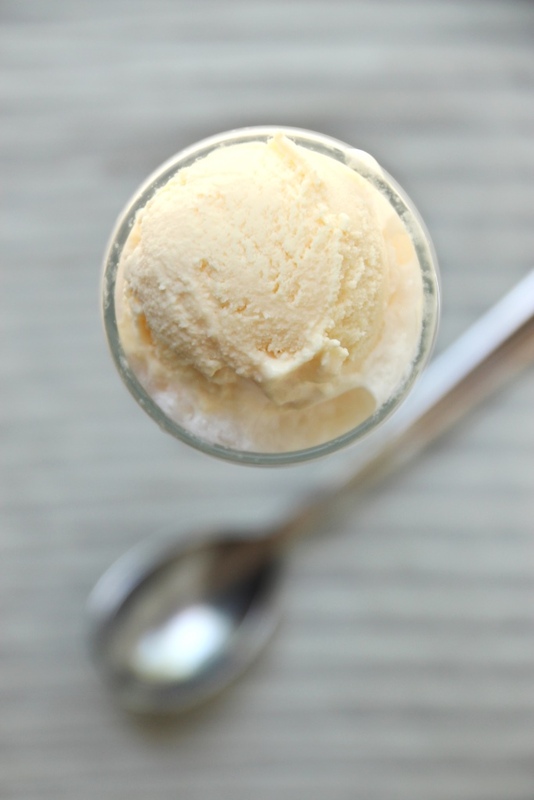 Likely I’ll use this method even for my orange creamsicle flavor in the future. For extra fun (and easy portion control), serve in champagne flutes. 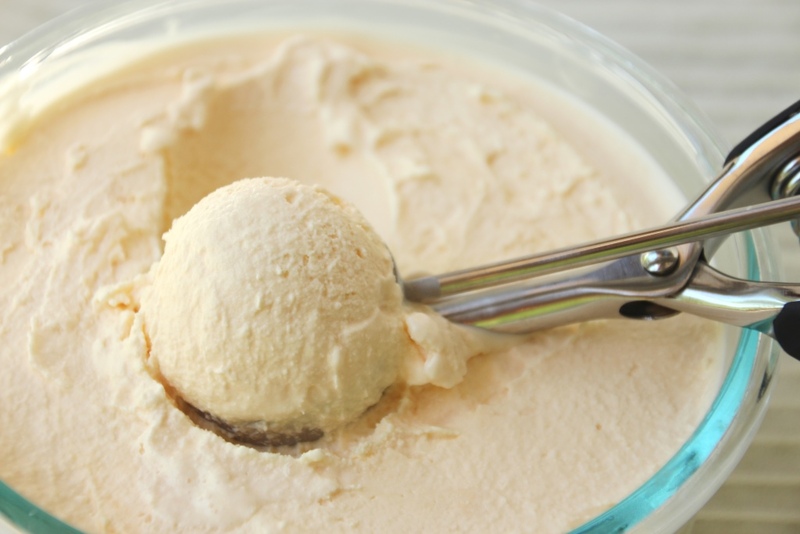 You could even scoop ahead of time and store in the freezer if you’re planning to serve it at a party. 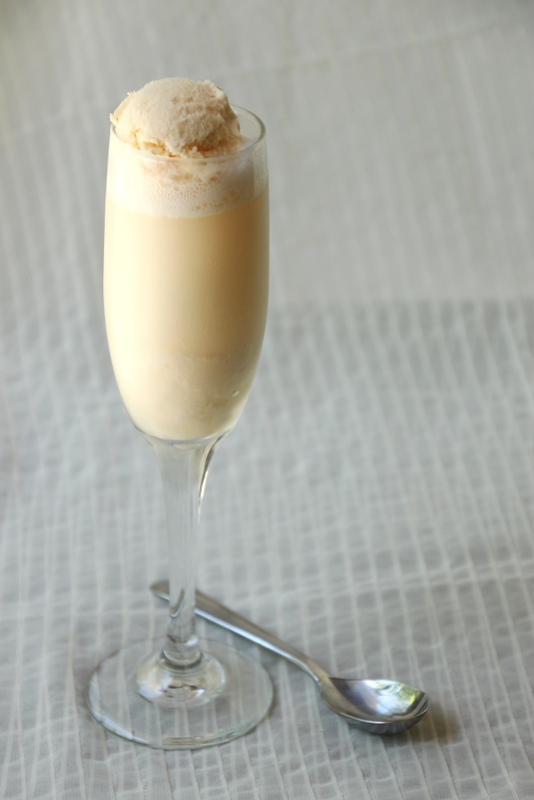 If you’re missing the carbonation, top each flute with a little extra champagne to make a mimosa float. Delicious and fun and sure to impress anyone you feel like impressing. This flavor is much less decadent than last week’s, and is great for a small portion. Give it a try for your next party, and definitely let me know how it goes! In a small saucepan, combine orange juice and champagne. Simmer gently over medium heat until volume is reduced to 1/2 cup (or slightly less.) Remove from heat and let cool for a few minutes on the counter. Whisk together all remaining ingredients until completely combined. Slowly stream in reduced orange mixture, whisking constantly. If desired, add food coloring. I used 4 drops yellow and 1 drop red for photography purposes, but add more or less to suit your preferences. It does lighten fairly considerably after it’s frozen. Place a freezer-safe bowl in your freezer to chill. Meanwhile, freeze ice cream according to your ice cream maker’s directions. Transfer to chilled bowl and return to freezer for at least 3 hours, or until ready to serve. 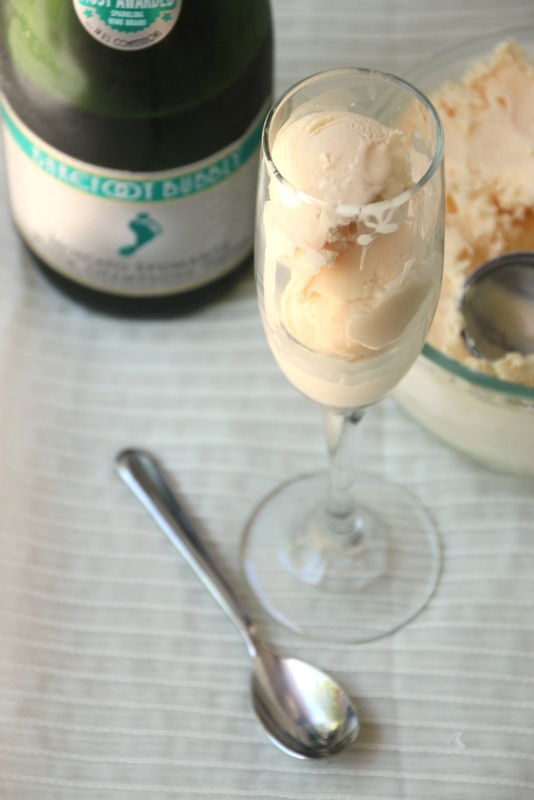 For floats, scoop small balls of ice cream (I used a 2 Tbsp cookie scoop) into champagne flutes. Carefully pour in champagne and serve immediately. 1 If you only have pulpy juice on hand, just use a mesh strainer to remove the pulp. You can use any ratio of orange juice and champagne as long as it adds to 1.5 cups total. It certainly does not have to be an expensive champagne (Barefoot certainly isn’t), but I do recommend using one you would willingly drink plain or in a normal mimosa. I hope you cherished or survived your Valentine’s Day, depending on where you stand with the so-called holiday. My anniversary with M happens to fall on this overly Hallmarked date and on that Saturday we celebrated six years together. We celebrated with a bike ride given the ridiculous lack of winter but it was a wonderful day nonetheless. M makes dinner (usually Swedish meatballs; yum) and I make a layer cake. I’ve made chocolate and raspberry and peanut butter and chocolate, as well as other delicacies not featured on this blog, and all were very delicious. This year, however, I was looking for something different. I perused Pinterest and implored the masses on Facebook, and happened across a scrumptious-sounding champagne cupcake on Sprinkle Bakes. Obviously I was looking to build a layer cake and not cupcakes, but the recipe looked easily adaptable. Just in case, I questioned Heather, the brilliant author of SB. Not only is she a brilliant blogger, but she’s a delightful person and promptly assuaged my very minimal doubts. Next step: buy champagne! Despite having nearly the entire bottle within the various pieces, it’s still a fairly light cake. The taste of champagne is definitely prominent but not overwhelming, and I felt it was a welcome change to the usual chocolate confections. I think M was a little disappointed it’s not the kind of cake you pair with ice cream, but I promised to make it up to him on his birthday. 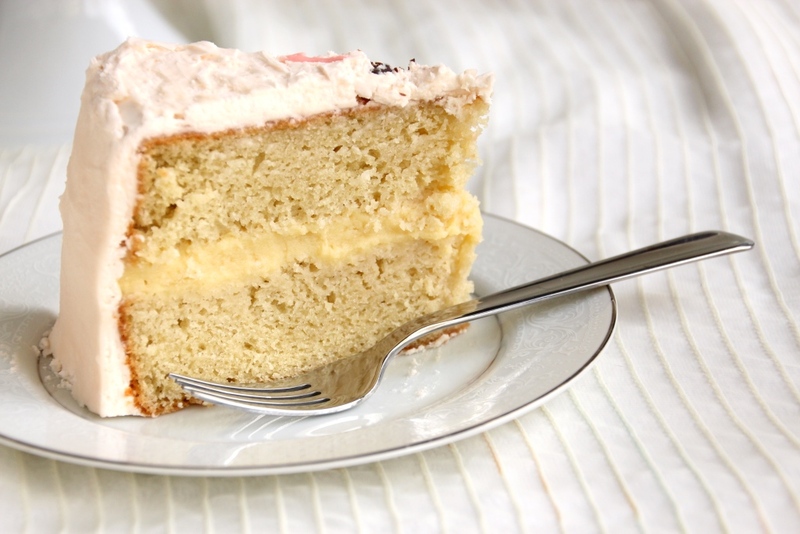 A soft crumb and a custard filling enveloped in a fluffy frosting make for a textural dream in addition to the totally different but amazing flavor. It would be an especially lovely ending for a dinner party if you’re a classy folk but would be great for any special occasion. 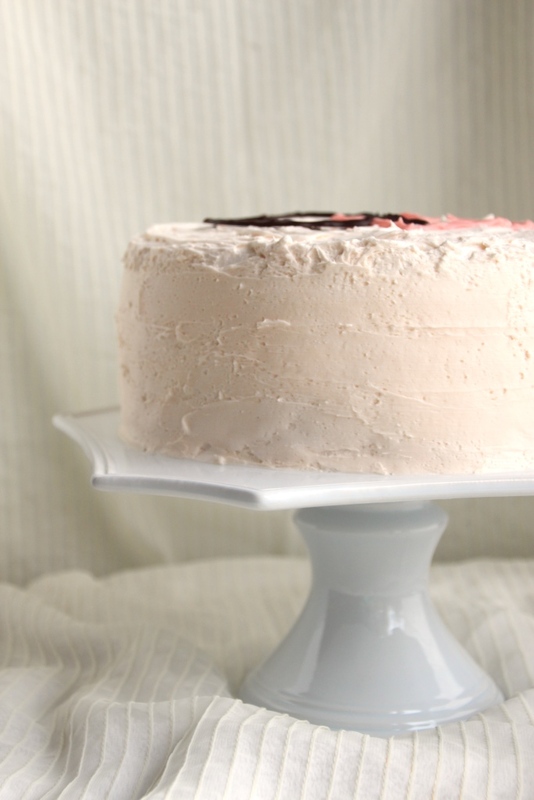 If you’re looking to switch it up from all the usual flavors, this is the cake for you. Preheat oven to 350 degrees Fahrenheit. Butter and flour two 9″ cake pans, lining the bottoms with parchment paper. (Butter and flour the paper as well). Cream together butter and sugar in the bowl of a stand mixer until light and fluffy. Add eggs one at a time, mixing completely after each one. Mix in vanilla. In another bowl, whisk together champagne and sour cream. Mixture will be fizzy. Starting and ending with the flour, alternate adding it and the sour cream mixture to the stand mixer. Batter will be thick. Divide evenly between prepared cake pans (about 3.5 cups of batter per pan) and bake for 30-35 minutes. Cake will brown but that’s okay! Allow to cool for 10 minutes in the pan, then remove to a wire rack to cool completely. 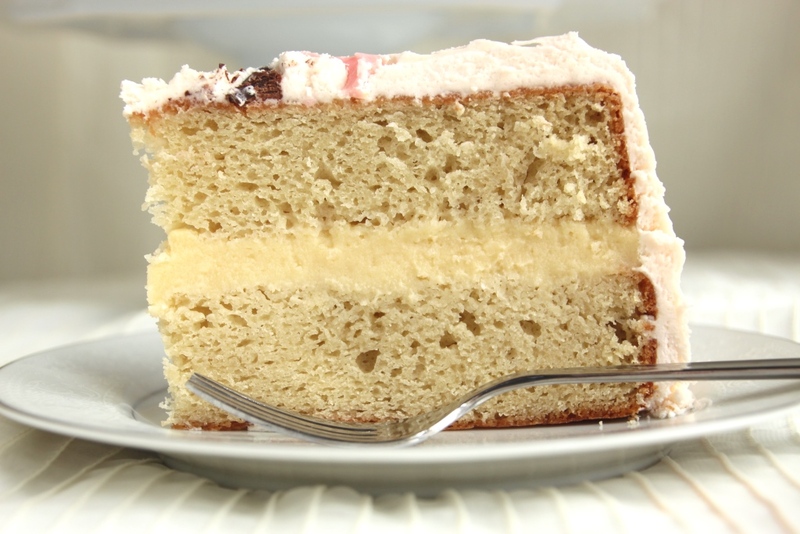 Freeze completely cooled cake layers for 30 minutes or until ready to use. Combine 1/4 cup heavy cream, champagne, and sugar in a medium sauce pan. Bring to a boil over medium-high then remove from heat. In a small bowl, whisk together 1/4 cup heavy cream and cornstarch, then mix in the eggs and egg yolks. Slowly stream in one third of the hot champagne mixture, whisking constantly so the egg doesn’t cook. Bring the remaining champagne and heavy cream mixture to a boil again, then stream in the egg mixture, whisking constantly until it thickens to a pudding-like consistency. Remove from the heat and stir in butter and vanilla. In a small saucepan over medium-high heat, reduce 1 cup of champagne to 2 tablespoon. Pour into a small bowl and allow to cool. Add butter and sugar to the bowl of a stand mixture and mix briefly by hand to incorporate the sugar. Cream together with the whisk attachment until mixture is well combined and fluffy, scraping the bowl once or twice as necessary. Mix in reduced champagne and additional tablespoon of champagne from the bottle. Prepare a cake board, trimming if necessary. 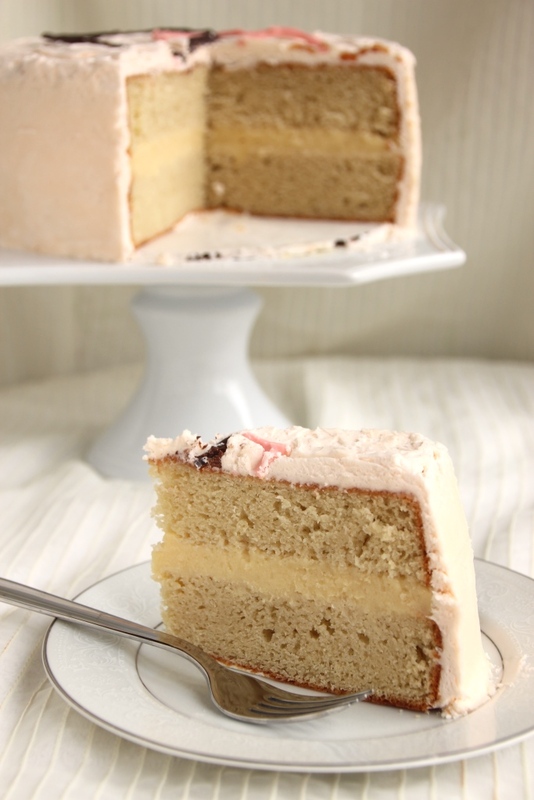 Level cake layers. 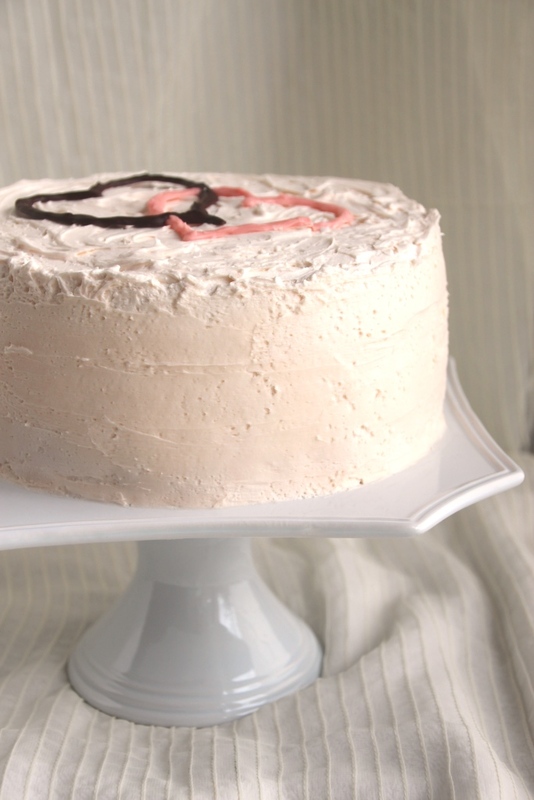 Place a small amount of frosting on the cake board and gently press one cake layer on top. Evenly spread desired amount of filling on the cake (I used the whole batch), then gently press the second layer on top (cut side down) making sure it’s level. Then use a spatula (or your finger) to ensure the edges are smooth. 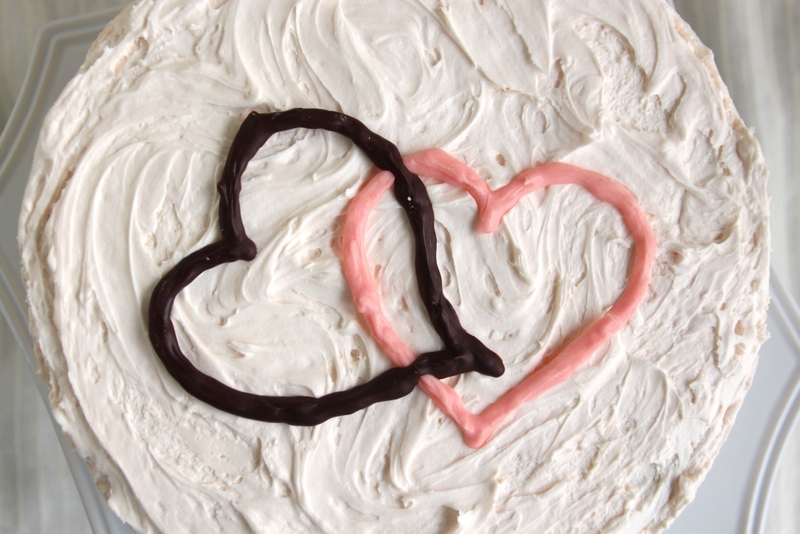 Spread and/or pipe the frosting on the cake, and decorate as desired. 1 This was barely enough frosting to spread on the cake. 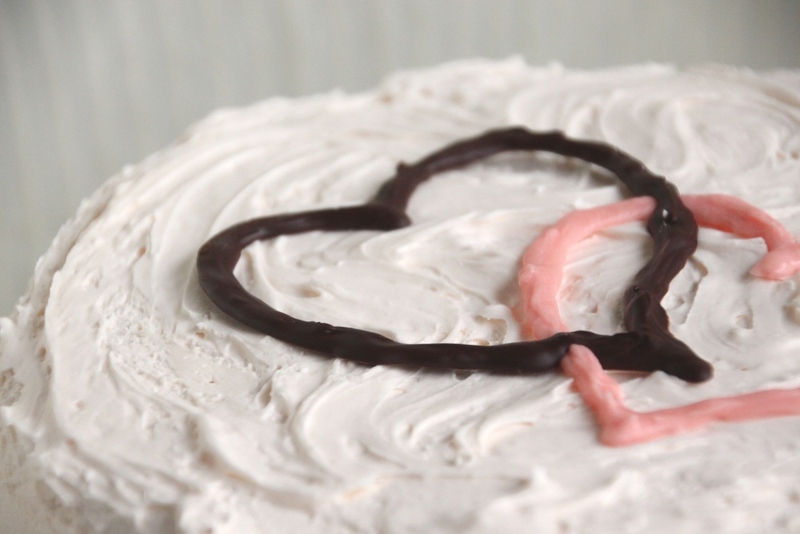 If you intend to do any piping or you like a lot of frosting, I recommend making 1.5 batches.